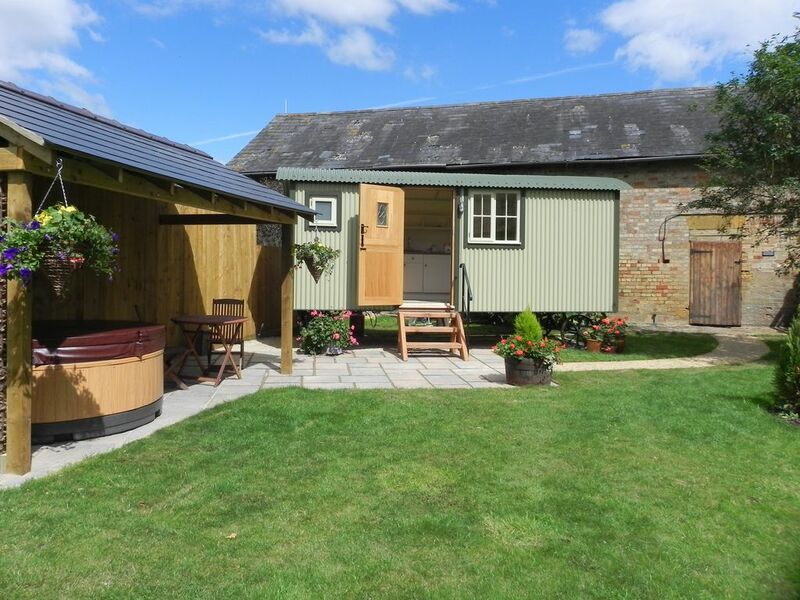 Tucked away amidst a range of traditional brick farm buildings are our two stunning shepherd's huts which benefit from there own private walled gardens, patio, private covered hot tubs and BBQ shelters. SHOULD THIS ONE BE UNAVAILABLE PLEASE SEE OUR OTHER LISTING, RED SKY SHEPHERD'S HUT, p8463516. Within this bespoke craftsman built shepherds hut is a cosy bed alcove with double bed (with down bedding-alternative available on request) & TV, kitchen and dining area and even a fully fitted shower room with toilet and basin. All in all a luxurious and romantic place to be! The Old Dairy Cottages & Shepherds Huts are part of Manor Farm, Aston Somerville near Broadway, there is great access to meadows, woodland and walks along the river. We are close to Broadway with good access to the Cotswolds, Stratford-upon-Avon and Worcester. Broadway offers fabulous places to eat as well as a good selection of shops to browse. Come and stay with us for a holiday, romantic short-break or just come and explore this beautiful part of the Cotswolds. I enjoy the outdoors and meeting people. We created our holiday cottage rental business in 2010 and have added Shepherd's Huts and a Glamping business here at the Farm. Our guests get to enjoy a peaceful rural setting and we take pleasure in welcoming them here. Each of our properties have their own private hot tub to relax in. Very quiet and relaxing, cosy with all needs catered for, will definitely be returning. We really enjoyed our stay in this little shepherds Hut. It was great to have a garden area and the hot tub was lovely! The home made lemon cakes and tea ingredients were a fab touch! We thoroughly enjoyed our stay here and the Old Dairy Shepherd's Hut had everything we needed. We went on one of the walks recommended in the information pack left for us which was really nice. The hut itself was actually bigger inside than I had thought it would be. Obviously it is very compact but very thought out with a big storage drawer under the bed so you can tidy away your belongings. We also brought our dog along with us too and there was enough room for him and his toys, it was also nice to have our own little garden area. Hot tub was lovely too! We did find response times a little slow and we had been trying to get in touch the week before our stay to check if we could bring our dog (as this hadn't been planned when initially booked) but didn't receive a response. However I did manage to speak to someone from the glamping site over the phone who explained that she knew it would be fine, we would just need to leave £25 in the hut on departure to cover cleaning costs. This was the only thing that was a little frustrating but apart from that no issues at all and we would definitely stay here again!! What a lovely place! The hut was larger than I had imagined and could lay straight legged in the bed without touching the wall with the bottom of my bed (I’m 6ft tall). There was a fully equipped kitchen with all the gear to make dinner and brekkie. Hot tub was a lovely edition which was great after a day out with a nice cold beer! Didn’t speak with the host much as everything was covered, however when I did there was a timely response and very accommodating. Would definitely consider coming back and recommend to friends! Shephards Hut was absolutely Amazing!! This little break lived upto every expectation. The property was impeccably clean, the decor was really sweet & cosy & the complimentary cakes were a lovely touch. The hot tub was the perfect way end the day (even in cold December) & was so relaxing. The only thing that let this experience down was the fact that we had requested to stay until 2pm on the day of departure but was told at 12 noon that the cleaner was waiting to come in so we had to leave. Clearly a breakdown in communication which was a little sad considering how beautiful our stay was here. I'd definitely recommend Shepherds Hut to anyone & will definitely be back in the future.